United States Army Garrison (USAG) Baumholder, affectionately known as "the Rock" is set in the wooded hills of the Western Palatinate in the German federal state of Rheinland-Pfalz. USAG Baumholder is located in a unique area centrally located in Europe with France, Belgium, Luxembourg, Holland, Austria, Switzerland, and the Bavarian Alps all within a few hours' drive. "The Rock" consists of H.D. Smith Barracks, next to the German city of Baumholder, and two small U.S. Kasernes outside of Baumholder: Strassburg Kaserne, in the nearby town of Idar-Oberstein, and Neubruecke, near the city of Birkenfeld. Baumholder and its sister communities are rich in history. First recorded mention of the town is found in a document dating back to 1156. World War II brought the military to Baumholder. The German government appropriated 29,158 acres and resettled about 842 families from 14 villages to clear the land for use by the Third Reich. In 1951, Americans took over the larger part of the post. Baumholder is now the home for the largest concentration of combat soldiers outside the United States. The mission of USAG Baumholder is to plan and execute force protection operations, deployment support operations, garrison support operations and German-American relations to sustain soldier, civilian and family well-being and readiness. The major command at USAG Baumholder, the 1st Armored Division, deploys to a designated theater, conducts full spectrum operations in support of the regional combatant Commander and redeploys to home station. Frankfurt International Airport is the closest major airport to USAG Baumholder. Most arriving soldiers have to process through 64th Replacement Detachment in Hanau. At Frankfurt International Airport, there are U.S. Army information booths in Terminal 2 and on the second floor of Terminal 1. If you come into Terminal 2, you have to take the "Sky Line" shuttle to get to Terminal 1. The Frankfurt Airport is approximately 2 hours from USAG Baumholder. When departing Frankfurt International Airport, follow signs for A5 towards Basel / Darmstadt. After a few minutes, you will see signs for A67. Get in the center/left lane and follow A67. When you pass the town of Lorsch, you will see an exit on the far right for A6 Mannheim, Kaiserslautern, and Saarbruecken. Take this exit and follow A6 towards Kaiserslautern/Saarbruecken. Passing Kaiserslautern, Exit A6 TO A62 towards Trier/Kusel. After about 20 minutes you will come to the exit Freisen. Take this exit. Exiting A62 at Freisen take a right and follow the signs for Baumholder. Once in Baumholder, follow the main road, take a left at the traffic light. Keep going straight through the next traffic light. You will see the main gate for Smith Barracks, Baumholder. Individuals who wish to use GPS should enter Baumholder as city and Aulenbacher Strasse as the street address. Frankfurt Airport has two railway stations. The long-distance railway station is at the AIRail Terminal, right next to Terminal 1. Trains arrive at and depart from platforms 4 to 7. In addition, there is a local railway station for S-Bahn, regional and local trains at Terminal 1, Level 1. Trains arrive at and depart from platforms 1 to 3. 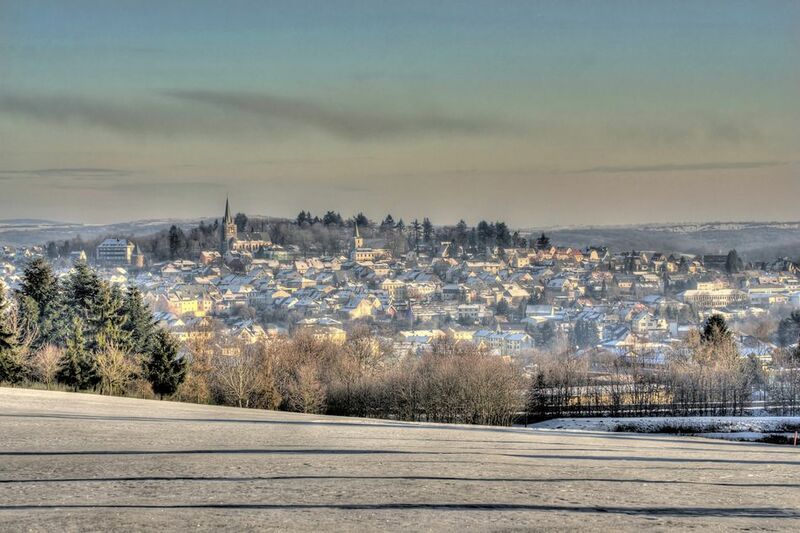 Baumholder has a population of more than 13,000 Americans and a local population of 4,800 Germans. USAG Baumholder provides logistical support to the soldiers and families assigned to elements belonging to the 1st Armored Division’s 2nd Brigade and logistical support to the resident tenant and support units themselves. Temporary Lodging for service members arriving at USAG Baumholder is at Lagerhof Inn, Army Lodging. For most new arrivals to Baumholder, the Lagerhof is their first contact with the community. The staff of the Lagerhof is well aware of this and is therefore eager to make new arrivals feel welcome and comfortable as they embark on their European tour of duty. The original three buildings making up the Lagerhof Inn were constructed in 1932 - 1934 and used as a Kurhotel by a private firm. During the war years, it was used by the German forces. US Military forces began using this facility in the early 1950s. A complete renovation started in 1983. The Lagerhof Inn reopened in 1984. In 1999 a new building was added to make up the present Lagerhof Inn. Pets are allowed at the Lagerhof Inn. However, there is a non-reimbursable fee for room fumigation of $50 and $3 a day pay charges. Guests traveling with pets are responsible for the care of their pets in and out of the rooms. Pets are not authorized to be left in the room unattended unless in a pet kennel and guests are required to pick up after their pets in the pet walk areas. Guests are responsible for all damage caused while staying at the Lagerhof Inn. A complimentary continental breakfast is served daily, and free in-house laundry for guests is offered. Reservations for official travelers are accepted 30 days in advance. Unofficial travelers - 24 hours in advance. The Reservation Desk can be reached at DSN: 485-1700 or Civilian + 49 (0) 6783-999 3300. Post Housing is available to all soldiers with command-sponsored dependents serving an accompanied 36 months tour, or who enrolled in the military couples program. Waiting time for government housing is 1 to 36 weeks depending on rank and bedroom requirements. 1-2 days after arrival, Service Members and their families will proceed to the housing office where they will be presented with housing options and wait times (currently approximately 4 to 6 weeks for enlisted quarters). Soldiers bringing family members who are not command sponsored will not be allowed to sign for family housing until command sponsorship is granted. Available units of family housing include: 1494 units for junior enlisted Soldiers (E1-E-6), 79 units for senior enlisted Soldiers (E7 and E8), 26 units for Sergeant Majors, 129 units for Company Grade Officers, 38 units for Field Grade Officers and 13 units for Senior Officers. Single Service Members and geographical bachelors E1-E6 will reside in Barracks. E7 and above will be assigned to private rental housing. Service Members residing in Barracks may be required to have roommates. Visiting children and family members are not authorized to stay overnight in Barracks. Currently, USAG Baumholder does not offer any handicap accessible housing on post. Individuals who require fully accessible housing may be best accommodated in private housing on the German Economy. Units with limited steps are available. Minor modifications such as handrails in the bathroom are evaluated and made on an as-needed basis. Units with air conditioners are not available in on-post housing. There are no authorized public schools in Germany. The Department of Defense Dependent Schools (DoDDS) system is the only authorized method of instruction for military dependents. There are two elementary schools, two in Baumholder on Smith and Wetzel Kasernes and one Junior/Senior High School located in Baumholder on Wetzel Kaserne. Age requirements are for Early Child Hood Education programs are Sure Start and Pre-Kindergarten Programs, a child must be 4 years of age by September 1. Kindergarten Programs, a child must be 5 years of age by September 1. For First Grade, a child must be 6 years of age by September 1. DoDDS-Europe Transportation Management Office (DETMO) assumes responsibility for all bus transportation for all students. Students must register with DETMO to receive bus passes. There is a variety of before and after school programs at all schools, as well as some interscholastic competitions for men and women during three seasons. A physical examination is required yearly to try out, practice and to play. The Special Education Department has the responsibility for screening all military families who have exceptional family members to see that the type and the seriousness of the disability are considered when assigning the families overseas, to ensure that the educational and medical needs can be met. Local German schools are available from Kindergarten to High School. They are in German only, and the sponsor must pay a fee upon enrollment. USAG Baumholder offers many opportunities for continuing education within the community both through online and evening courses. Mission Level 1 - Deployed: Free registration, free hourly childcare during mandatory deployment meetings and FRG meetings, 16 free hours of respite care per month, reduced hourly rates, 20% reduction for full and part-day care, up to 4 free SKIES classes per child, up to 2 free team sports per child. Mission Level 3 - Task Force Rock: Free registration, free hourly care during mandatory deployment meetings and FRG meetings, 5 free hours of respite care per month, reduced hourly rates, up to 2 free SKIES classes per child, 1 free team sport per child. Warrior Transition Unit - Unlimited free hourly care for medical appointments, reduced hourly costs, category one fees for full and part-day care, free registration, free hourly care during FRG meetings and mandatory deployment meetings, 16 free hours of respite care per month, up to 4 free SKIES classes per child, up to 2 free team sports per child. USAG Baumholder CYSS offers two full-day child care centers located on Wetzel and Smith Kasernes. In addition to part-day programs, hourly care is offered on a space-available basis for children between 6 weeks and 5 years of age at Dispensary CDC. Family Child Care is offered as an alternative and supplement to center-based care for children 4 weeks through 12 years of age. FCC providers are certified and offer a variety of services including nighttime care, extended care (overnight and weekends) and specialized care for children with special needs. School Age Services offers a before-and-after school program for children on schools days. Youth Services offers a middle school/teen program open to youth grades 6-12. Baumder, like most military installations in the Kaiserslautern Military community, maintains a clinic on the installation. The present facility, previously a hospital, is undergoing intense renovations and sections of the health clinic will temporarily relocate to accommodate the renovation project. Baumholder has a family practice, pediatrics, optometry, and physical therapy clinics, as well as EA laboratory, pharmacy, X-Ray, physical exam, immunization/allergy sections, and female wellness. Expectant mothers are evaluated and followed throughout their pregnancy at the Baumholder clinic, and later referred to Landstuhl Regional Medical Center for delivery of the baby. LRMC offers state of the art medical specialties for specialty care in an American facility, Landstuhl Regional Medical Center (LRMC). Each government housing area is within a few minutes of a German hospital, which provides quality care, including a 24 hour a day emergency room. Baumholder has dental care capabilities that include orthodontics and pedodontics. Family Members can expect to receive preventive, basic restorative, and essential specialty dental care required to maintain good oral health for the duration of your assignment in Europe. However, at the Baumholder Dental Clinic services to the Family Members are on currently on a space available basis only. It's strongly advised that all Family Members enroll in United Concordia Dental Insurance through TriCare to avoid unnecessary delays and ensure the accessibility of care on the economy. German dentists are available throughout the local community, but you may find their services to be quite expensive without this dental coverage.